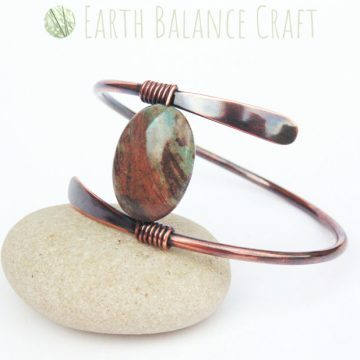 A hand-made patina copper wrap around bangle featuring a flat oval patterned jasper stone with green and blue shades of jade. Inspired by my love of the depths of the forest, where the trees are dense and ferns cover the woodland floor. This minimal style of wire work jewellery would suit someone with a gypsy soul and Bohemian spirit. Variation: Each piece is hand-crafted individually and will vary slightly in appearance. When ordering you will receive a replica of the design shown. Slight differences will occur due to the hand-made nature of copper metalwork. The photographs in the gallery show a number of versions of the design on multiple backgrounds to give the most true to life image. Please note the jasper stones vary in colour with shades of blue, green and brown as per the last photograph in the gallery. Semi-Precious Gemstone: Jade coloured jasper. Metal: Size 3.0mm (9ga) solid copper wire with a patina finish polished to reveal the warm coppery tones beneath. The copper has been sealed with a gloss varnish. Width Approx: 3cm / 1.1 inch at the widest part. Sizing: This depends on your knuckle size (to get the bangle over your hand) and how snug you like the fit. A bangle is a closed bracelet and should be just big enough to slide on over the broadest part of your knuckles. The best way to ensure a good fit is to measure either the diameter or the inside circumference of a bangle you already own that fits you well. Measuring Guide: If you do not have a bangle to measure, it can be difficult to buy the right size online. If your wrist size is much smaller than the broadest part of your knuckles then the bangle may fit too loosely on the wrist, even if the measurement over the knuckles is the right size for you. Read over this page for your guide to measuring your bangle sizes. Jasper is an earthy stone, known to be nurturing to the wearer. It has harmonising, strengthening and stabilising properties. Seen as a stone to help during phases of stress, it helps to protect and dispel negative energy. In the body it helps the liver and gallbladder and aids the balance of yin yang energy. A hand-made oval shaped copper cuff bracelet wrapped with garnet and moonstone beads. This delicate wire bracelet is inspired by nature, with a swirling mist over hedgerow shrubs heaving with ripe berries. The deep shades of red garnet contrast with the watery moonstone beads and dappled coppery tones. The copper has been oxidised to darken and polished to reveal the metallic highlights again. 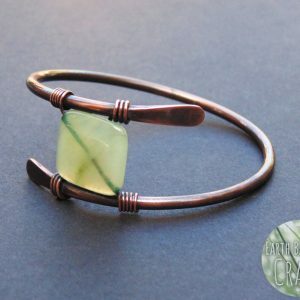 This pretty copper wrap bangle features a soft green jade stone as the centre piece. Inspired by the Celtic goddess ‘Nemetona’, known as ‘she of the sacred grove’. Nemetona guards over open spaces and tree groves where spirituality and religion were practiced, creating a quiet sanctuary of peace and protection. Her elements are earth and water, which perfectly reflect the qualities of jade stone. This pretty women’s copper bracelet features a purple amethyst pebble bead as the centre piece. Making this design the perfect February birthstone gift. The copper bangle has a distressed patina finish with pretty hammered paddle shapes where the wire ends. Inspired by the thistle wild flower, with purple and lilac colours. A classic style for women who love minimal jewellery. 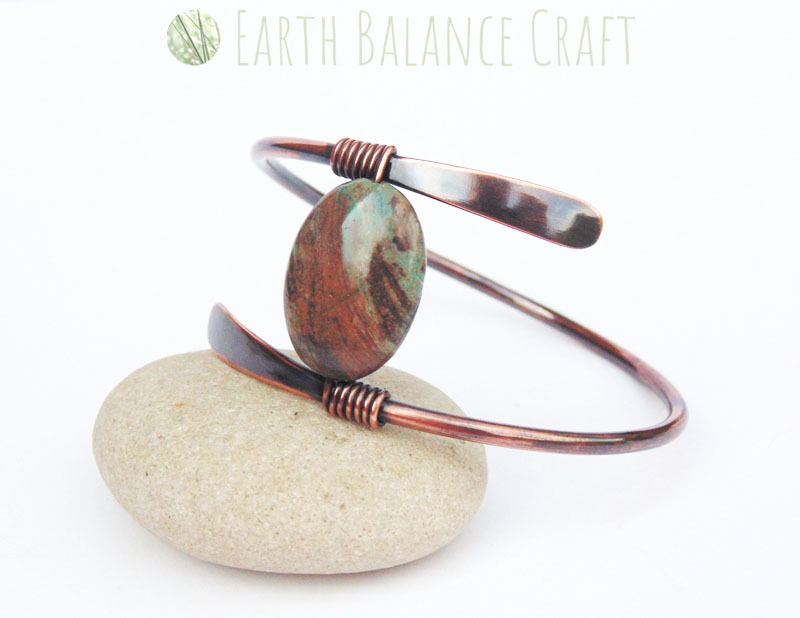 This copper wrap bangle features a fluorite pebble gemstone as the centre piece. Inspired by the Oceanides, known as salt water nymphs and minor goddesses of the sea, in mythology they were the daughters of Oceanus. The fluorite stone varies in watery colours of green, aqua and purple. The design is a rigid bangle in a chunky style, with oxidised metal and minimal wire work. The magical holly and ivy, this pair of yule-tide decorations celebrates the heart of winter when despite the cold and seemingly still earth, two evergreen species are thriving. The masculine holly tree with his prickly green leaves and vibrant red berries stands together with the feminine mistletoe plant, with her soft gentle twining vines and luscious white berries. They compliment each other perfectly and are known as the king and queen of yule. These festive decorations are designed to be ‘heirloom pieces’, with quality and longevity in mind, to be used for years to come to celebrate the winter solstice. This striking feather hanging decoration is inspired by the magical peacock bird. The design is hand-made with copper wire work, adorned with sparkly gemstones and Czech glass beads. The colour palette showcases the metallic blues and greens found in the male peacock’s feathers. Hang in a sunny spot in your home for year round shimmers of colour, or out in the garden for extra colour. A beautiful hand-crafted wire-work dragonfly suncatcher adorned with carnelian, agate, aventurine and glass beads. This decorative window hanging is inspired by a summer time river scene with a dragonfly swooping close to the rivers edge, throwing sparkly crystal-like reflections into the water. Suitable for both indoors and outdoors use, we love the rich warm colours that catch the sunlight and bring this little insect to life. Delicate polished patina copper droplet earrings with garnet stones. This design combines metallic coppery tones and highlights with deep magenta. The style is reminiscent of swirling mist over woodland shrubs heaving with ripe berries. Each pair of earrings is lovingly made by hand. A sweet little jenny wren bird hanging decoration with patina copper wire work and a soft brown colour palette of agate beads. A rather adorable British bird that is a familiar sight in gardens and countryside across the UK. The contours of this design outline her distinctive shape, with an up-turned tail and round tummy. The little wren bird is steeped in ancient tradition, from the druids who associated wisdom and divinity with the creature to the celts who see the wren as symbolic with creativity, vibrancy and friendliness.